AT LAST NIGHT’S meeting of Dublin City Council (DCC), councillors voted in favour of naming a street in honour of Savita Halappanavar but it is unlikely that any will be renamed any time soon. The vote passed by 35 to 10 with four abstentions, but renaming a street just five years after a person’s death would not be possible under current DCC rules. Halappanavar was 17 weeks pregnant when she was admitted to University Hospital Galway on 21 October 2012. She died one week later on 28 October after miscarrying and going into septic shock due to E coli in her bloodstream. To honour the memory of Savita Halappanavar, who tragically lost her life as a consequence of the Irish State’s barbaric and antiquated attitudes to women’s reproductive rights, that a street in our capital city be named in her memory. The proposal was put forward by Solidarity-PBP councillor Tina MacVeigh. 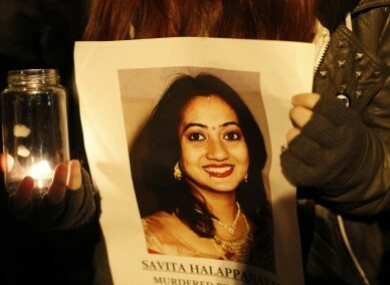 She said that while “Savita’s life had dignity and meaning, her death had neither”. A number of councillors objected at the meeting, and it is unclear which street would be renamed in her honour as residents of that road or area would usually make an application. However, for the street to be named after Halappanavar, current rules would need to be changed. The guidelines state that nominations to have aspects of the city named after them will have to have died “at least 20 years previously”. Nominees will have to have died at least 20 years previously or have passed the centenary of their birth whichever is earlier. A lesser period may be considered by the Committee in very exceptional cases with subsequent agreement by the City Council. Chair of the committee Sinn Féin councillor Micheál Mac Donncha told TheJournal.ie last November that renaming a street after Halappanavar would most likely not be possible under the current guidelines. “Under the current guidelines a person has to be dead for at least 20 years before they can be nominated,” Mac Donncha said. “Personally I think Savita should be honoured in the most appropriate way. But under the current rules that we have that wouldn’t be possible without those being changed. Email “Councillors vote to name street in honour of Savita Halappanavar but it's unlikely to go ahead soon”. Feedback on “Councillors vote to name street in honour of Savita Halappanavar but it's unlikely to go ahead soon”.